I'd like to present to visitors my Norwegian Forest Cat. His name is pousse-mine (pencil in french). I found him one summer day on a sidewalk (just like in the movies!) and he's been a loving companion ever since. It took me a while to discover his true origin (there was something peculiar about his looks) and I was pleased that he was a pure breed cat of sorts. I later learned that there is few of us in Quebec that have the pleasure of owning a Norwegian forest cat (they are not as popular as in Europe). Hi Benoit... nice to hear from you again. I love your handsome boy Pencil! Great looking cat. The Norwegian Forest Cat is popular in the North American continent. Hi, I also found a Norwegian Forest Cat. My nieghbor called me and told me she had a feral cat captured and she was taking it to the pound. I told her I would take it. She was starving, just bones, almost near death. She was 4-6 mos old, rapidly gained weight, and became so unusual that we studied the breeds, and she is a beautiful. incredibly strange and intelligent, black and white, Forest cat. She is now about a year and big and sturdy. I'm not a cat guy, but this cat doesn't seem like a cat at all. Will not leave your side for long, patrols the house at night like a watchdog. 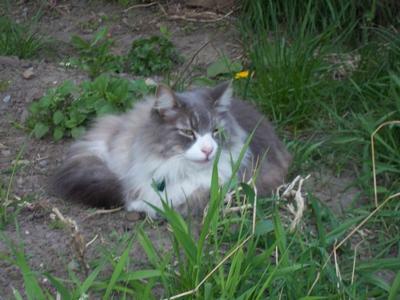 Hi, We are very interested in a Norwegian Forest Cat Rescue. Could you please send me any information if these cats are for adoption. Hi Sheila, if you can tell me where you live (approximately) I’ll try and respond fully. Thanks for asking.